The ocean is a wild, mysterious place. We are aware of a lot of things going on below the surface of the water, but we are even more aware that we do not know most of what there is to know. This mystery of the deep regions has fascinated and haunted us from ages ago, longer than we remember. Now, thanks to science, we know that there are probably between 28,000 and 32,000 fish species in the oceans around the world (and that’s without counting other ocean life forms such as invertebrates and mammals). Out of these, we usually meet very few, and some of the most familiar faces are more prized than others. If you love fishing, you know what I’m talking about: there’s that one fish, that one adventure, that you just keep retelling over and over. There are many factors that might make a fish an unforgettable catch as well as an awesome specimen in its own right. Speed is certainly one of them. Moving fast underwater is no easy feat! It requires a body adapted to it through thousands of years of evolution. Some of these amazing creatures are pretty well known. Here is the top 10 list of the fastest known fish in our oceans! This beautiful fish species is native to the Atlantic and the Pacific. More specifically, you might find it in the subtropical regions of these oceans. It looks, in all honesty, as a crazy scientist’s experimental cross of a bird and a fish. 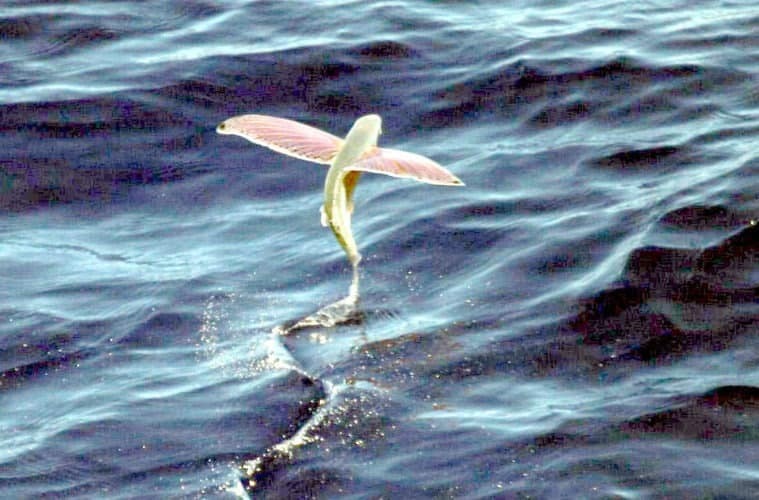 Besides literally being able to fly up to 400 meters (1,300 feet), thanks to its unique anatomy, this little fish can move at 56 km/h. The bonefish is an inhabitant of warm, inshore, and shallow, tropical waters. It may not look like much, but it’s one of the fastest fish in the world! Its silver body can measure around 90 cm or 35 inches in length. It’s frequently found in grassy or muddy waters and can swim at around 64 kilometers an hour. It also tastes great with a dash of pepper, if you manage to catch it. The swordfish (also called broadbill) is the ultimate catch for many avid fishermen and women! It’s quite a sight: their fierceness and unique anatomy make them, and their bill, a unique species. The swordfish lives in the temperate and tropical waters of the Indo-Pacific and Atlantic Oceans but migrates quite a bit. During its many travels and fights against obnoxious fishermen, the swordfish uses its incredible speed (64 kilometers an hour) to its advantage. A denizen of the deep, the blue shark can inspire feelings of either terror or admiring respect. And respect it certainly deserves: this amazing creature, living in tropical and temperate oceanic waters, migrates for extended distances. They can live up to 20 years and swim at speeds of up to 69 kilometers per hour. Unfortunately, the Blue Shark’s conservation status is nearly threatened today. The Atlantic Bluefin Tuna is actually a group of species that live in, well, the Atlantic. Also, in the Mediterranean Sea (shouldn’t that go in the name too? False advertising!). Some of these fish can reach a full length of 2.5 meters and a whopping weight of 250 kilos. I’d like to see anyone try to reel one of these babies. Or even catch them: the Atlantic Bluefin Tuna can swim at an impressive speed of 70 kilometers an hour! Also known as the Bonito Shark, the Mako is the fastest shark in the world: it can reach a speed of 74 kilometers an hour. Add that to a lot of terrifyingly pointed teeth, intelligence to spare, and a weight of up to 570 kilos, and you get a shark you do not want to cross! The mako, however, doesn’t usually attack humans. It’s very sought after by fishermen, and it has been known to jump up to 9 meters in the air, landing on boats. The wahoo, whose name sounds like an aural metaphor for speed, is an iridescent inhabitant of tropical and subtropical warm waters everywhere. It can live in schools of up to 100 individuals and is fished for food in many places around the globe. This species can swim at the truly impressive speed of 78 kilometers per hour. The Marlin can be sometimes confused with the already visited Swordfish, but it’s actually a completely different group of species. The Striped Marlin, in particular, is very sought after by fishermen. It’s a big (up to 4.2 meters long) and heavy (up to 190 kilograms) predator that inhabits the temperate and tropical waters of the Indo-Pacific. Part of the Striped Marlin’s attractive is its speed: it can swim at 80 kilometers an hour! If you visit or fish in the Indian or Pacific Oceans, you might find yourself face to face (bill? gills?) with the Sailfish. This species is named that way because of their impressive dorsal fin: you’ll know the Sailfish when you see it. If you manage to catch a glimpse, that is: this beauty can swim at 110 kilometers per hour. Ah, the Black Marlin. The unofficial king of the Marlins lives in the Indo-Pacific and, just like all somewhat extreme or plain weird creatures, off the coast of Australia. This impressively muscled fish can weigh up to an insane 750 kilograms and has been recorded as swimming off a line at 129 kilometers an hour. This giant of the oceans is considered the ultimate prize for all game fishermen. They are all pretty awesome, right? Fish are (at least, they are to me) some of the most fascinating creatures on the planet. Maybe it’s because they are so different from us. Or, perhaps, because of the specific abilities each species has, such as hurtling through and out of the water at breakneck speed! I know that I’ll never get tired of observing, learning about, and getting to know these mysterious beings that live in the waters of our world. And, if I somehow skip all the evolutionary process and develop scales and fins overnight and feel like racing underwater, I know where to find the fastest, fiercest competitors! Bonus #1 – What is the Fastest Fish in the World?